As individuals, Tun Dr Mahathir Mohamad and Tun Dr Siti Hasmah Mohamad Ali are uniquely intriguing: he, as the twice-nominated prime minister of Malaysia, and she, the witty and faithful supporter of the nation’s leading man. As a couple, their fondness for each other is palpable even more after 60-odd years of marriage. Age knows no bounds for their public displays of affection, playful banter and the emotional bond established in those years of building a family and a country simultaneously. 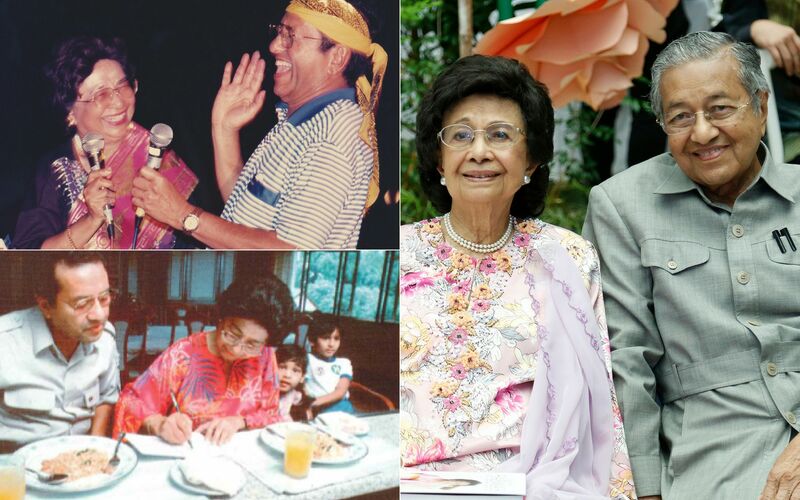 Through thick and thin, and in sickness and health, Tun Dr Mahathir and Tun Dr Siti Hasmah have stood by each other year after year, and we’ve got the photos to prove that. For a dose of evergreen couple goals, look no further than the oldest ‘first couple’ of Malaysia, who proves that love indeed gets finer with age. Tun Dr Mahathir and Tun Dr Siti Hasmah met in 1947, as students at King Edward Medical College, Singapore. It was no 'love at first sight' for the two – rather, their studies brought them together. Where other male students showered their attention for Tun Dr Siti with chivalrous gestures, Tun Dr Mahathir won her heart as a study buddy. The top student offered his guidance in subjects Tun Siti needed to pass her exams – which she did, with flying colours. The couple got married in 1956, 4 years after Tun Dr Mahathir graduated and a year after Tun Dr Siti Hasmah completed her education. In 1957, the couple welcomed their firstborn, Datin Paduka Marina, followed by Mirzan, Tan Sri Mokhzani and Datuk Seri Mukhriz. In 1960, they adopted Melinda, and 2 more children in 1983, Mazhar and Maizura. Their love for children is a telling sign of their nurturing qualities, the foundation of their roles as ‘parents’ of Malaysia. Career commitments and national responsibilities drew the couple closer, in many ways. As the Prime Minister’s wife, Tun Siti Hasmah thrived in the opportunities and privileges that included travelling, meeting a diverse group of people, and serving in welfare organisations. In 2005, the power couple put on their best black tie attire and graced us with their presence at the Malaysia Tatler Ball. Tun Mahathir had retired in October 2003 after serving as Prime Minister for 22 years. Dancing should be in the books for every great politician. At the party, Tun Dr Mahathir granted the audience an eyeful of his groovy moves, partnering up with daughter Datin Paduka Marina for a first dance. Not one to be left out, Tun Dr Siti, proved a competitive counterpart, cranking up her own moves on the dance floor. At the 2005 ball, Malaysia Tatler was honoured to present Tun Dr Mahathir with the Lifetime Achievement Award in recognition of his unwavering dedication to the country. He even brought his classic sense of humour to the function, bemusing guests as he jostled in to admire the gigantic annual centerpiece cake. Turning a ripe old age of 90 in July 2015, Tun Mahathir had surely seen a fair share of birthday cakes but today was much more special. The close knit family chose to mark his milestone birthday with Tun Siti Hasmah’s 89th birthday and their grandchild Mia’s 7th birthday. It’s not playing with your food when the end game is to feed each other sticky rice, in this continuation of Tun Mahathir's 90th birthday celebration. In March 2016, the couple couldn’t be more proud witnessing the conferring of the Chevalier de la Légion d’Honneur (Knight in the Legion of Honour) to their firstborn, Datin Paduka Marina. As Tun Dr Mahathir and Tun Dr Siti Hasmah grow older, it gets harder for them to sit still for the cameras before someone cracks a joke and produces the cutest Kodak moments. Case in point, this 2016 photoshoot. Tun Dr Siti Hasmah took a far different approach for her 90th birthday celebration, but with family and Tun Dr Mahathir by her side, of course. The occasion marked also marked the launch of her book ‘My Name Hasmah’. After 90 years as a mother and grandmother, it’s only apt for Tun Dr Siti Hasmah to receive her doting family’s heart-filled dedications through performances and speeches in this intimate but grand birthday party. While on a work trip to Tunis, Tun Dr Mahathir had a go at his selfie skills, with a vantage point of his eternal sweetheart as she soaked up sunshine and fresh air. Despite being hospitalised with heart problems earlier in 2018, Tun Dr Mahathir was a ruthless political 'comeback kid'. With the steadfast presence of his 'wingwoman', he bounced back to health in no time. This is what winning the race looks like: With his no 1 fan by his side, loyally providing her moral support well into their golden years. If you thought couple matchy-matchy outfits were cheesy, let their red outfits make it cool all over again. Behind every leader, is a life partner who can't wait to share a great joke. Tun Dr Siti Hasmah is a riot and Tun Dr Mahathir indulges her by playing along. 2 months as Malaysia's second Prime Minister, many sleepless nights, and the holy month of Ramadan later, these 2 couldn’t wait to kick back and celebrate the Raya season with their brood. It’s back to business with the 14th parliamentary sitting led by Tun Dr Mahathir's Pakatan Harapan. The pair marked the occasion in full regalia and serene smiles. The golden couple's love is just one aspect of Merdeka: Let their spirit of unity and love for each other set an example of love and respect within the nation. Tun Dr Mahathir Mohamad The nation's longest serving premier is steering our country to a new era after returning to the Prime Minister's office.